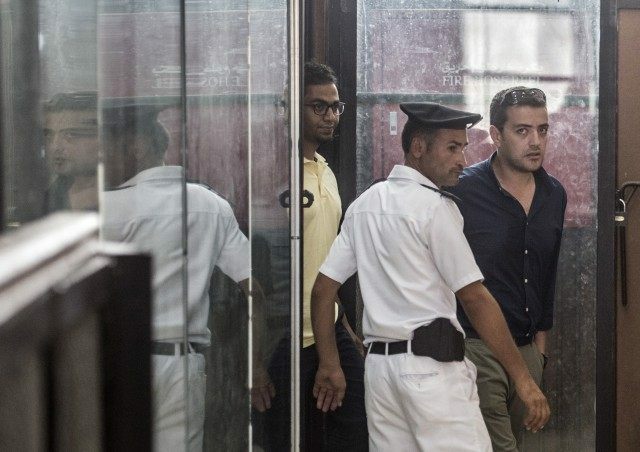 31 Aug 2015 Washington, D.C.
An Egyptian court sentenced three Al-Jazeera English journalists to three years in prison for broadcasting “false news,” igniting outrage by international human rights and free speech advocates. The reporters have been identified as Canadian national Mohammed Fahmy, Australian journalist Peter Greste and Egyptian producer Baher Mohammed. They were found guilty of broadcasting “false news” and an array of transgressions. Fahmery and Mohammed were present during the court proceedings. Mohammed was given an additional six months behind bars and a fine of $640. Greste, who was deported back to Australia in February, was sentenced in absentia. In his ruling,on Saturday Judge Hassan Farid said he “sentenced the men to prison because they had not registered with the country’s journalist syndicate. He also said the men brought in equipment without security officials’ approval, had broadcast ‘false news’ on Al-Jazeera and used a hotel as a broadcasting point without permission,” reports The Associated Press (AP). They were also convicted on charges that included “conspiring with the Brotherhood, and endangering national security, but they have maintained their innocence,” notes CNN. “They broadcast video footage that contained false news and aired it after editing it on Al Jazeera with the aim of harming the country,” reportedly said Judge Farid. The defendants maintain their innocence, saying they were doing their job, covering all sides of the stories in Egypt. All three journalists were originally convicted in June 2014. They appealed a their convictions, were granted a retrial, and released on bail. The court’s recent ruling means Fahey and Mohammed must return to prison, acknowledged Al Jazeera Media Network’s acting director general Mostefa Souag, who condemned the verdict, saying it “defies logic and common sense” and follows an unfair trial process and politically motivated, reports CNN. Authorities under the presidency of Egyptian general-turned Abdel-Fattah el-Sissi, who as military chief led the overthrow of Islamist President Mohammed Morsi, are being accused of violating free speech. Sherif Mansour of the Committee to Protect Journalists criticized the court’s decision in a statement. The trial itself “makes a mockery of justice in Egypt. Today’s verdict must be overturned immediately. We consider them to be prisoners of conscience, jailed solely for exercising their right to freedom of expression,” added Philip Luther, Amnesty International’s Middle East and North Africa direction, in a statement.